Wow! We got to grow a Passiflora vine finally! The right image shows our first seedling, recently repotted (on July 23th) into a large pot and located against the chain-link fencing at our backyard. It’s growing very well and is now about 38 cm tall, growing too vigorously, I’d say! Pearly surprised us after the Sunset Mass Celebration in our church, on July 4th with this healthy seedling. “It’s a Purple Passion Flower plant, which will bear very sweet passion fruits and great for making juices”, she exclaimed! Yum…just anticipating that works up my salivary glands! We’ve been longing to grow a Passion Flower for a long time since we first saw an absolutely beautiful vine with fascinating blooms in November 2007 at our local garden nursery. That’s almost a two-year wait!! See this purple beauty…isn’t she gorgeous! She was the one that bewitched us and kept us hoping to own one someday! However, comparing its lovely 3-lobed leaves with those single, large and serrated foliage of our seedling, it’s obviously a different species or cultivar altogether. Subsequently, last month, during a local pilgrimage to Church of St. Paul at Kuala Kubu Baru on June 20th, we encountered another passiflora. What a remarkable red beauty this time, Passiflora coccinea (Red grandilla)! An amazing surprise, we’ve never expected to see one in our country. I had a marvelous time being mesmerized by it and capturing its loveliness with my point-and-shoot Canon PowerShot A60. Pearly and her spouse, who were also among the pilgrims must have seen my ‘obsession’ and decided to satisfy that thirst with a purple passionflower seedling exactly two weeks later! How generous and thoughtful of her. God bless you, dear friend! 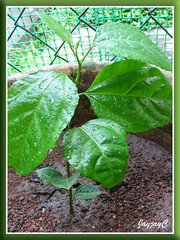 Meanwhile, our seedling goes by the name of Purple Passion Flower until it matures and eventually blossoms. Then only will we be able to search for its proper identification. Update: August 2 – I bit the bullet and did the first tip pinching on our passiflora this morning! 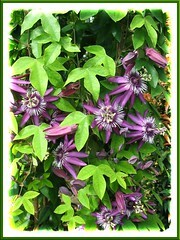 Read about how to prune and propagate a passiflora vine, if you’re interested. Just want to mention few matters concerning passiflora. 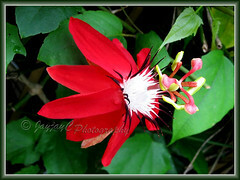 1) Passiflora attract insects especially ants. Do you prepare your own pesticide or have one on your own. Do you recommend which one you use? 2) I’m amazed that passiflora does so well in pot-bound. Normally I noticed they need ground growth. How did you maintain them in pots? 3) How long does the flower bloom last? In most cases, the passiflora vine is all leaves and very few flowers and create a messy bunch of vines. Do suggest how to maintain them. Don’t know much about passiflora vine, James. This is our first attempt at planting one. I did read online though that one has to pinch the tip often to promote branching or give a hard prune when it becomes unruly. We’ll see how it goes as our seedling continue its growth/climb. I’ve given its first pinching 5 days ago and am delighted to notice a leaf bud appearing at the axil today. Regarding pesticides, we rarely use on our plants unless really necessary (especially for orchids) as I’m allergic to them. John uses very diluted malathion infrequently. If our plants are attacked with mealy bugs, spider mites, ants and the like, we’ll usually squash them with our gloved-fingers or just remove the plants if too badly infested. Thanks for your info. I was thinking of making my own pesticide which is much safer and milder. I had checked from the internet and found that you can do one just from the kitchen. My ciku tree is infested with mealy bug which is been farmed by ants. And so, I’m planning to wage war with my new homemade pesticide. I had tried spraying water to wash off the mealy bugs and ants but they come back all the time and just removing the plant is just too much for me as I really treasure all of them dearly. Do let me know if you are interested in the details of making your own pesticide with just the kitchen ingredients? Garden pests can be truly annoying at times!! Thanks for the offer, James. Presently, the need hasn’t arise.